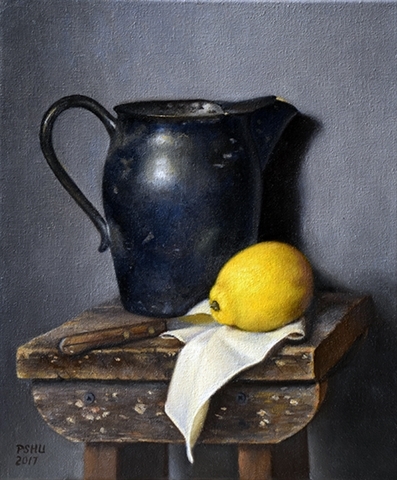 Lanesboro Arts presents “Beauty in Simple Things,” an exhibition of still-life oil paintings by Patricia Schu. The exhibit opens with an artist reception on Saturday, April 14, 2018, from 6-8 p.m., and runs through June 17, 2018. The reception will include wine and hors d’oeuvres, as well as live music. Always free and open to the public, the Lanesboro Arts Gallery is open from 10 a.m. to 5 p.m. on Tuesday through Saturday through April 28. The gallery will also be open on Sundays from 11-4 p.m. beginning on April 29. A Minnesota native, Schu was born in Minneapolis, where she now lives with her husband Carl and cat Goldie. Her love of art emerged as a child and has continued throughout her adult years. Although many of those years were spent working and raising her three children, she would eventually set aside time for art classes at various local colleges. As time moved on, so did the kids, and Schu was able to retire after 26 years in the financial services industry. The possibility of full-time art became a reality. After checking out several art schools, Schu enrolled in part-time classes at The Atelier Studio Program of Fine Art (formerly known as The Atelier Lack) in Minneapolis. Within a month, those part-time classes led to full-time studies. Using the techniques of the “old masters” in an environment of master artist/apprentice is the primary instructional method of this program. The fundamental principles of realistic drawing and painting in the classical style are emphasized throughout the four-year program, which Schu completed in May 2010.